What does alcohol advertising tell young people about drinking? 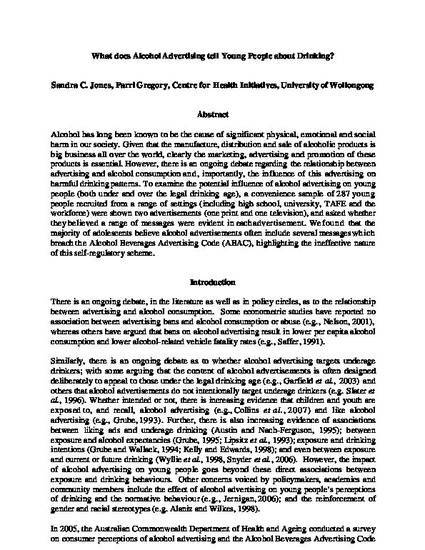 This conference paper was originally published as Jones, SC and Gregory, P, What does alcohol advertising tell young people about drinking?, Proceedings of the Australian and New Zealand Marketing Academy (ANZMAC) Conference, 2007, 1168-1174. Alcohol has long been known to be the cause of significant physical, emotional and social harm in our society. Given that the manufacture, distribution and sale of alcoholic products is big business all over the world, clearly the marketing, advertising and promotion of these products is essential. However, there is an ongoing debate regarding the relationship between advertising and alcohol consumption and, importantly, the influence of this advertising on harmful drinking patterns. To examine the potential influence of alcohol advertising on young people (both under and over the legal drinking age), a convenience sample of 287 young people recruited from a range of settings (including high school, university, TAFE and the workforce) were shown two advertisements (one print and one television), and asked whether they believed a range of messages were evident in each advertisement. We found that the majority of adolescents believe alcohol advertisements often include several messages which breach the Alcohol Beverages Advertising Code (ABAC), highlighting the ineffective nature of this self-regulatory scheme.